00:00:11.02	Hello, I'm Roger Tsien. 00:00:13.01	And I'm here today to tell you about fluorescent proteins. 00:00:37.17	beginning to help us with super-resolution. 00:00:45.28	this jellyfish is where it all began. 00:00:48.13	And in a way, this is the creature that we most have to thank. 00:00:52.13	This is the jellyfish Aequorea victoria. 00:01:01.24	we'll learn a little bit more about him soon. 00:01:18.11	and the water is disturbed, it emits a glow. 00:02:04.05	for having invented GFP. 00:02:15.04	glow of the jellyfish. 00:02:24.18	where the jellyfish can still be found. 00:02:27.01	And we are illuminating with ultraviolet light right now. 00:02:31.27	And you may be able to see that there's a circle here. 00:02:36.18	There are little dots around the edge; that is the jellyfish glowing. 00:02:45.03	that we are exciting with the UV lamp. 00:02:47.06	I'm sorry the beaker is a bit fluorescent. 00:02:52.01	but it's some yellow background. 00:02:53.19	But nevertheless, you can see the jellyfish there. 00:02:57.02	And it's upside-down and confined to this little beaker. 00:03:01.11	is poke it to stimulate the flash. 00:03:07.22	that the jellyfish is slightly moving around. 00:03:16.26	and in a moment, we're going to bring in this rod, with which we are going to poke it. 00:03:21.17	Then we turn out the lights, and we stir. 00:03:28.08	- not the light that previously had been applied from a UV lamp. 00:03:33.18	So that's it. That's the flash. 00:03:38.19	it was sort of greenish - maybe. 00:03:41.04	Anway, the man who discovered that phenomenon is shown here. 00:03:50.11	he published his first paper on aequorin. 00:03:54.06	And that was really the protein he was most interested in. 00:03:56.07	It had the really exciting job of turning chemical energy into light. 00:04:09.27	and that later he mentioned that it changed color of the jellyfish from the blue of aequorin to the green of GFP. 00:04:29.00	but he got it almost absolutely, completely correct. 00:04:32.00	There were only very very small modifications from later work that came in. 00:04:40.19	in the rehearsal for the Nobel Ceremony. 00:04:42.08	And he is actually holding a UV lamp. 00:04:44.29	That's the violet that's on your left, and then next to it is the tube of GFP. 00:04:50.27	And this is the last tube in existence that is actually made from real jellyfish that he had kept in his freezer all this time. 00:05:04.22	of the photograph who in 1992 published the cloning of the gene for GFP. 00:05:10.23	And that was a long struggle. He didn't know what to look for. 00:05:15.11	And he could not predict that it would become green fluorescent. 00:05:30.14	We didn't know whether it needed any cofactors. 00:05:39.07	with light, it uses small molecule cofactors. 00:05:53.07	to get from other sources, and that binds into the protein to make the functional protein. 00:06:05.23	Or the chromophore structure that Shimamura had proposed might take many enzymes to generate out of the protein. 00:06:37.23	in worms, then you would generate fluorescence. 00:06:40.21	And that proved that GFP was self-sufficient. 00:06:44.01	It knew how to make its own chromophore out of its own guts. 00:06:47.25	Fred Tsuji, not shown here, also did very very soon after Chalfie independently. 00:07:08.24	where just at this stage still amino acids. 00:07:20.05	which people are still now somewhat debating exactly how it happens. 00:07:24.16	We generated extra double bond; we generate a ring, and so on. 00:07:28.23	And all of this does require oxygen. 00:07:34.02	when this protein is growing, it cannot become fluorescent or doesn't even absorb light - let alone become fluorescent. 00:07:56.16	cannot tolerate oxygen at any stage of their life cycle. 00:08:00.14	In other words, obligate anaerobes. 00:08:02.08	But they are a limitation. You do need oxygen. 00:08:17.19	onto the amide bond of Ser65. 00:08:22.16	And this is a very strange reaction, you might think. 00:08:25.25	Since when does one amide attack another. 00:08:35.01	where the side chain amide of glycine attacks the side chain amide of Asparagine. 00:08:53.17	and also that it's relatively unencumbered in its NH group. 00:09:10.06	but rather Gly67 - every known fluorescent protein has Gly67 in it. 00:09:16.27	And maybe it's because that's necessary for that first step. 00:09:19.29	Later on, the Asn-Gly goes into a different path. 00:09:26.15	It also forms a ring, but it spits out ammonia and so on. 00:09:29.28	And they diverge. Now there's one important other feature about this chemistry that I have to mention. 00:09:44.01	connecting the beta-hydrogens of the tyrosine that connect it to the rest of the chromophore. 00:09:53.14	So O2 pulls off H2, and the product is hydrogen peroxide. 00:10:00.26	H2 + O2 does not give you water in this case. 00:10:04.07	You have to balance the number of hydrogens and oxygens. 00:10:06.23	H2 + O2 gives you H2O2, which is hyrdogen peroxide. 00:10:14.15	that's generated for every molecule of GFP. 00:10:16.23	And that's sort of required by the conservation of mass. 00:10:30.11	and making a heck of a lot of GFP could generate one mole of hydrogen peroxide per every mole of GFP you make. 00:10:36.22	And you have to keep that in mind. 00:10:43.00	against a slow bit of hydrogen peroxide that's trickling out. 00:10:46.10	And we seem to be ok, but it's something that you have to keep in mind. 00:11:02.20	maybe a little bit earlier than I drew here. 00:11:05.27	So the original jellyfish protein actually was not very strongly fluorescent. 00:11:12.09	This dotted line here is the spectrum of the wild-type GFP. 00:11:17.28	And it has a big peak at around 400 nm - just below 400 nm. 00:11:24.10	In other words, the jellyfish actually GFP glows best in the UV. 00:11:35.16	and that's the one everyone wants to use. 00:11:48.01	and only 1/6th of the time, the visible, we really don't know. 00:12:24.14	which was this mutation S65T + a folding mutation to make it fold a little bit better. 00:12:36.05	grew and lives in Puget Sound or very cold water. 00:12:53.05	and basically wouldn't fold officially. 00:12:58.28	then gradually made the protein able to tolerate warmer temperatures and fold more efficiently. 00:13:15.25	and it showed a beautiful 1-stranded beta-barrel. 00:13:31.03	an alpha-helix that carries the chromophore. 00:13:42.27	whereas everything else is just beta-strands or alpha-helix. 00:13:46.21	And this revealed why, in a way, no other enzymes were necessary. 00:13:58.18	so nothing else could have ever gotten that. 00:14:12.28	hydrogen peroxide gets out. 00:14:23.02	and showed that the GFP was also dimeric. 00:14:29.12	there's an equillibrium between the two. 00:14:44.26	and this greasy patch enables dimerization. 00:14:48.24	And this is something to keep in mind again. 00:15:07.11	when it wouldn't otherwise have been. 00:15:09.18	We have forced it to be dimeric by fusing it to GFP. 00:15:13.12	And that often changes the cell biology and messes things up. 00:15:26.07	nobody else cares, so to speak. 00:15:28.23	Nevertheless, there's been a lot of interest in the dimerization, and we now know exactly how to get rid of it. 00:15:58.01	and we supress the dimerization. 00:16:05.08	to fix the dimerization problem, and they don't seem to have any bad effects on any of the other properties of GFP. 00:16:11.04	So can we get other colors? 00:16:15.00	And there was a lot of interest in getting other colors for various reasons. 00:16:29.27	we can distinguish all of these. 00:16:48.21	except S65T puts all of its energy into this green instead of only 1/6th of it. 00:16:54.26	It turns out to be possible to make a blue, a cyan, and evena somewhat yellowish version. 00:17:02.01	It's not awfully yellow; it's a yellowish-green still. But we call it YFP. 00:17:06.08	And these were found by various substitutions of the chromophore or around the chromophore. 00:17:20.27	and change it to a histidine, then we get the blue. 00:17:23.22	If we change it to a tryptophan, we get the cyan. 00:17:27.08	Ánd by the way, the UV peak was when this tyrosine was neutral. 00:17:32.27	And the green peak was when the tyrosine is negatively charged. 00:17:44.06	and make it subject to environmental influences. 00:17:47.17	And by changing the ratio basically of the UV to the visible peak, we can make a GFP that switches on due to environmental influences. 00:18:08.28	and thereby it's close in 3-dimensional space. 00:18:18.18	that makes it a somewhat yellowish-green. 00:18:31.06	but it turns out that fluorescent proteins are fairly widely distributed in nature. 00:18:41.29	if they were, we'd all be walking around like sort of the green giant. 00:18:58.13	jellyfish, and corals, and some other related organisms. 00:19:07.22	and that was the brilliant discovery of a Russian group, first author Matz et al. 00:19:13.02	And they have subsequently have done a lot of the phylogenetic tree by doing this classic molecular evolutional and genome analyses. 00:19:22.01	So a lot of you know, of course, tropical corals have beautiful colors. 00:19:36.21	and particularly, one that attracted a lot of interest and was the subject of that first paper by Matz et al. 00:19:43.29	was Discosoma, which has a beautiful red fluorescence. 00:19:52.17	for a red fluorescent protein that they called Ds for Discosoma - DsRed. 00:19:59.01	And it proved to be this beautiful red color. 00:20:13.18	and fluorescing red instead of green. 00:20:58.23	and this extended chromophore then turns out to beautifully explain the red color as even shown by quantum mechanical calculations. 00:21:11.27	pleased with themselves, and they used the actual bacteria expressing the protein and used this ink, and with little toothpicks, they drew the structure on a petri dish. 00:21:22.16	So you can both see the beautiful red color and the structure that gives rise to to it all in one picture. 00:21:41.13	for why the coral should want to have these colors. 00:21:45.08	But whatever it is, the protein was not ideal for cell biological use. 00:21:50.07	The biggest problem was that it turned out to be a very tight obligate tetramer. 00:21:55.07	GFP was a weak dimer, and even the weak dimerization gave problems. 00:22:01.19	But DsRed being a tight tetramer often prevents proper trafficking, or fusions. 00:22:22.29	and its detailed structure is shown here. 00:22:42.03	the plaque is of course trying to make this connexin-43 wants to make a hexamer on its own. 00:22:48.26	Two of them eventually get together to 12-mer or decamer; meanwhile, the connexin-43 is trying to make a tetramer. 00:22:56.14	The two clash with each other, and you get a mess. 00:22:58.21	And the protein can never make a gap junction. 00:23:06.29	and it didn't finish the job. 00:23:08.00	It left some green behind. 00:23:09.19	But the fact that it went through green stage is an interesting clue. 00:23:13.02	Eventually, these were all fixed by mutagenesis. 00:23:21.25	But eventually now, we now have a whole gamut of different colors. 00:23:32.26	and it turned out to be not too hard to change their color. 00:24:02.22	which each color references. Like this one is honeydew. 00:24:06.28	because honeydews are sort of yellowish green. 00:24:13.14	- all these different beautiful red colors. 00:24:14.15	The one exception that really isn't monomeric is so-called tandem dimer Tomato. 00:24:20.16	And that is actually two copies of the original 11-stranded beta-barrel that are permanently genetically fused to each other. 00:24:28.08	And in that way, they satisfy each other. 00:24:30.25	This protein is not a tetramer; it's a dimer. But it's internally satisfied. 00:24:35.21	It's got two copies, and when you fuse it, you fuse both together as one unit. 00:24:42.02	And that's why we call it a tandem dimer. 00:24:52.17	actually there's some varieties that were made from original jellyfish as well. 00:24:56.28	It now turns out that there are proteins that can be deliberately changed with light. 00:25:08.14	like fluorescence recovery after photobleaching. 00:25:16.09	which starts out green like DsRed. 00:25:29.21	and that is what switches it from green to red. 00:25:51.25	the subsequent fate of just those proteins that had been labeled. 00:25:55.24	So those proteins that were in the spot first lost their green color - not quite completely. 00:26:02.13	It might have been better if it had been complete, but they lost it considerably. 00:26:06.04	And then there's some recovery as proteins move around into this illuminated zone. 00:26:10.16	And meanwhile, the red protein made in the spot then over time spreads out. 00:26:16.15	And we can watch. And these are 1, 2, 3, 4 are different regions of interest in the original that were being tracked. 00:26:37.17	it fades away and reaches essentially down to nothing. 00:26:41.23	And you might think that this protein is dead, and most fluorescent proteins had you done it, you'd be right. 00:26:51.29	and comes back fully completely, just about, rejuvenated. 00:27:07.07	and there's a slight bit of rundown as you go through many many many cycles. 00:27:12.01	But you can do this over and over again. 00:27:13.12	And the applications for repetitively following movements inside cells or as you will later hear from other people for doing super-resolution microscopy. 00:27:24.04	There are major implications that have been exploited, but I don't have the time to go into them here. 00:27:51.13	lit up the letter D, and then they erased it again. 00:27:54.01	and then they wrote it again, this time the letter R, et cetera and wrote out its name. 00:27:58.17	Ok, so I don't have time talk more about these very interesting photochemically active proteins. 00:28:09.04	I'm now gonna turn briefly to the question of how do we look inside a more intact animal. 00:28:13.01	especially animals that are not quite as transparent as the ideals. 00:28:25.05	they are transparent, but many of the other important ones like mice or flies are somewhat more opaque. 00:28:42.03	below 600 nm, and that's because of the peaks of hemaglobin. 00:28:46.20	After all, that's what makes us pink. 00:28:53.00	you can't easily excite through much thickness of this tissue. 00:29:14.19	if we had fluorescent proteins that could be both excited and would emit longer than 600 nm. 00:29:32.08	and sort of marginal. 00:29:33.01	But we'd like to get out say to the 700 or so. 00:29:37.14	And it turns out that this is possible, but you have to be willing to go to a whole new protein family. 00:29:43.13	And this protein family is now back to cofactors. 00:29:49.16	These are small organic molecules. 00:29:51.20	This is what we were afraid the jellyfish and corals were using. 00:29:58.26	from the heme biosynthesis pathway. 00:30:22.22	when we break it down with an enzyme called heme oxygenase, the first breakdown product is called biliverdin. 00:30:40.21	and you turned a sort of black and blue, a lot of that color is broken down heme that makes biliverdin. 00:30:47.09	And later bilirubin here, which is part of what gets excreted. 00:30:58.28	Some organisms elaborate it into known fluorescent pigments that have these more elaborate cofactors. 00:31:06.28	But it turns out that bacteria use bilverdin in proteins that sense light. 00:31:11.16	And by mutagenesis, it was possible to prevent them from sensing light and instead use the energy to fluoresce. 00:31:18.22	These now make infrared fluorescent proteins that absorb at 680-some nanometers and emit just over 700 nm, hence, their name as infrared fluorescent proteins. 00:31:38.18	or the cell provides biliverdin. And as I said, most of our cells make it. 00:31:41.16	If necessary, you could can supply the extra by injection if you don't think they make enough of their own. 00:31:50.08	And so up to now, this has been the only way to decisively get beyond 600 nm. 00:32:14.22	which is essentially hopeless. 00:32:18.24	of a corresponding GFP-transfected mouse that's got that. 00:32:21.14	Instead, all you see is the autofluorescence or the fur around the outside. 00:32:26.24	Whereas this stuff is shining through the abdomenal cavity. 00:32:31.11	And there's many things more that need to be done to improve this relatively recent work. 00:32:35.25	There's actually thousands of phytochromes; this is extremely widely diversified gene family. 00:32:41.16	There may be possible to get longer than what I just described. 00:32:52.08	somewhat similar to microscopy but at a more a less-space resolution but greater depth inside intact animals. 00:32:59.06	It provides colors that are orthogonal even to the wide range we've already got. 00:33:05.18	It could be an acceptor for fluorescence resonance energy transfer if it's quantum yield was improved a bit more. 00:33:32.18	and this is a possible way we could detect that activity in a cell that doesn't have much of its own and doesn't have any other source of biliverdin. 00:34:02.15	actually tried to draw a sunset with a green flash as you might see it from the beach not far from our lab. 00:34:10.20	Thank you very much. 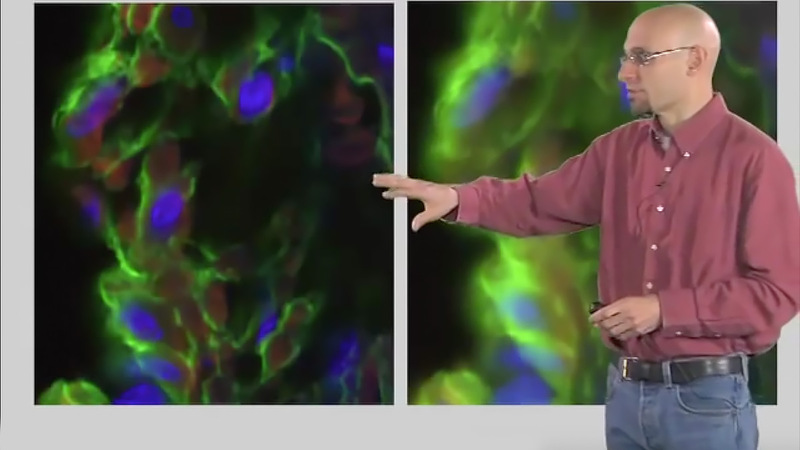 Live cell imaging has been revolutionized by the discovery of the green fluorescent protein (GFP). Roger Tsien talks about fluorescent proteins and covers the history of GFP, how it folds and becomes fluorescent, how it has been mutated to produce additional colors (blue, cyan, yellow). It also covers novel photoswitchable and photoactivatible fluorescent proteins, whose color can be changed by light, and new infrared fluorescent proteins. Red fluorescent proteins were derived from which organism? Which of the following is true for the generation of the GFP fluorophore?